This week we finished My Father's Dragon. We identified character traits to describe the crocodiles in chapter 9 and found supporting details from the text to justify our answers. We made a prediction about the way Elmer's mother would react if Elmer brought the baby dragon home to her! To accomplish this, we had to go back and reread parts of chapter one to see how Elmer's mom reacted to the stray cat. Next week, we will do a final activity to close our unit. Over the summer, I recommend reading the next two stories in the trilogy to continue the adventure! -using context clues to define words. -using textual details to justify answers. The students chose traits to describe the characters encountered in chapters 7 and 8. They used details to support their understanding. We looked at the actions, feelings, thoughts and words of the characters. Next week we will finish the book and complete some final activities. This week the students read and analyzed chapters 5 and 6. We created a plot hill diagram for chapter 5 to show how chapters within a novel also follow a certain structure. We reread sections that describe the setting and discussed why the author would include such details. We also learned about character traits this week. Students identified character traits to describe the tigers in chapter 5 and the rhinoceros in chapter 6 based on their actions in particular parts of the story. We focused on traits that demonstrate the "inside of a character" such as feelings and thoughts. We explored the traits of greed and vanity specifically. Over the past four classes, the group has been reading and analyzing passages closely. This is referred to as "close reading." (See the Week 2 post for a link to close reading). When they practice close reading, students reread a section of text and then answer a question that is generated from the passage read. Students make inferences and draw conclusions to find an answer that uses details from the read passage. In a sense, the passage being read is "closed" to outside information. This is a different type of reading comprehension strategy than making connections (text-to-self, text-to-text and text-to-world). All of these strategies have their place at certain times. It is important that we emphasize the importance of using the text to find the answers with the children. The group continues to examine text structure. This week, we discovered the author uses setting and character description at the beginning of each chapter. We also looked at the ends of chapters. We found that often times Ruth Stiles Gannett ends with a piece of foreshadowing to hook the reader into the next chapter. We look forward to reading chapters five and six next week. This week the students continued to practice using context clues to find the meaning and clarify the meaning of words. 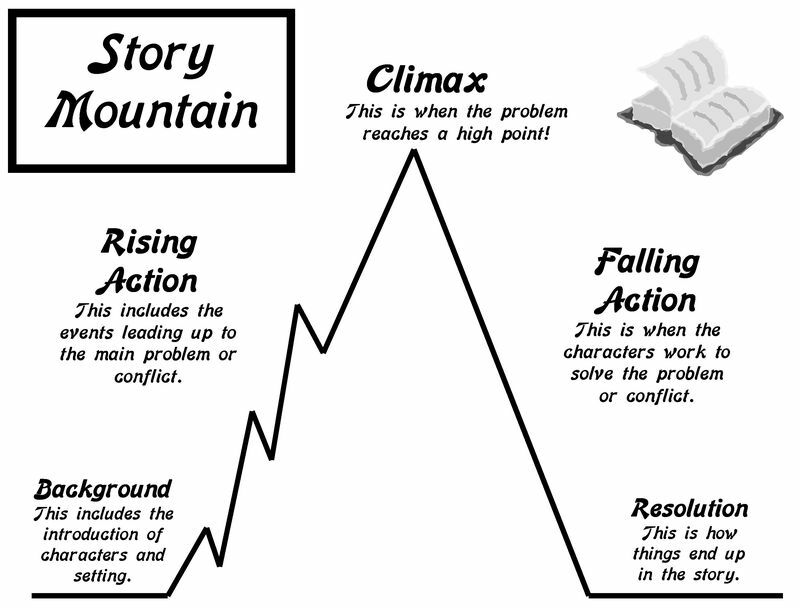 The students were introduced to a plot hill diagram (traditional plot hill) as a way to understand the structure of a fiction novel. We examined how during the different parts of a story (beginning, middle and end) we usually find certain story elements. For example, in the beginning, we learn about the main characters and setting. In the middle, the main character usually has to face a major problem, and therefore he/she makes some kind of big decision. In the end, the main character solves his/her problem. We will be charting these events from My Father's Dragon on our own plot hill diagrams as we continue to read. This week the students engaged in a close reading of a section of chapter two. They also used context clues to decipher the meaning of words. Using context clues helped them to understand words on a deeper level even though they may have had an idea of what the word meant. This activity helps students more appropriately use the word in context. In other words, when students use context clues to uncover the meaning of a word, they can then use it in their everyday lives more readily and correctly. This is in contrast to looking up the meaning of a word in a dictionary and using the dictionary definition to understand the word. I encourage your child to dig deeper and use context clues to uncover the meaning of new words he/she comes across. -using context clues to find the meaning of unknown words. -explaining the importance of characters and events. -describing the characters and setting. NEW vocabulary words that we came across included: obliged and inhabited. Students should read chapter 2 by next class (during their independent reading time at school) and answer a question about a vocabulary word. Other books in the My Father's Dragon series include: Elmer and the Dragon and The Dragons of Blueland. Katie and the Sad Noise and The Wonderful House-Boat Train are books that may be used to enrich text-comparisons. Last week, the students finished the final story in the book The Stories Julian Tells. How do they (characters) feel? What are they (characters) good at? What do they (characters) want? What do they (characters) look like? How do they (characters) act? We continue to practice using textual details to support our thinking. Last Sunday's Gospel reading was about the parable of the fig tree. I could not help but be reminded of the story of the fig tree in The Stories Julian Tells. This week in classes, we will draw some parallels. Be sure to check-in with your child about what we discuss! This week the students read "Because of Figs" from the book The Stories Julian Tells. We answered questions and focused on using evidence from the text to support our responses. We continued to explore imagery and how the author uses specific adjectives to create a picture in our minds. This week, the students read another tale from the book The Stories Julian Tells. We analyzed more figurative language such as imagery and personification. We discussed how imagery is a vivid description that uses the five senses to create a picture (image!) in our minds or the reader's mind. We discussed how personification is a description that gives a non-human thing human (person!) characteristics. For example, "The seeds were dreaming." Some books for exploring imagery include: Snowflake Bentley, There is a Flower at the Tip of My Nose Smelling Me, and Where the Wild Things Are. Some books for exploring personification include: Dirty Laundry Pile, Open Wide: Tooth School Inside, Sweet Tooth,and When I Was Built.